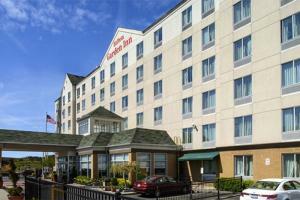 Located only a quarter of a mile from JFK International airport, the Hilton Garden Inn Queens/JFK Airport Hotel is perfect for a stopover or New York holiday. Enjoy exciting sporting events at the nearby Barclays Center and Yankee Stadium, or enjoy an night out at the Resorts Casino, only a mile away from the hotel. Spacious guest rooms feature Garden Sleep System® beds, free Wi-Fi and premium TV channels. Enjoy a cooked-to-order breakfast in the Great American Grill restaurant, which also serves popular American cuisine for lunch and dinner. You can stay on track with your exercise routine in the fully equipped fitness center. JFK International Airport is about a 4-minute drive from the hotel, and Jamaica Locust Manor Station is about a 6-minute drive away. Great American Grill - breakfast, lunch and dinner.